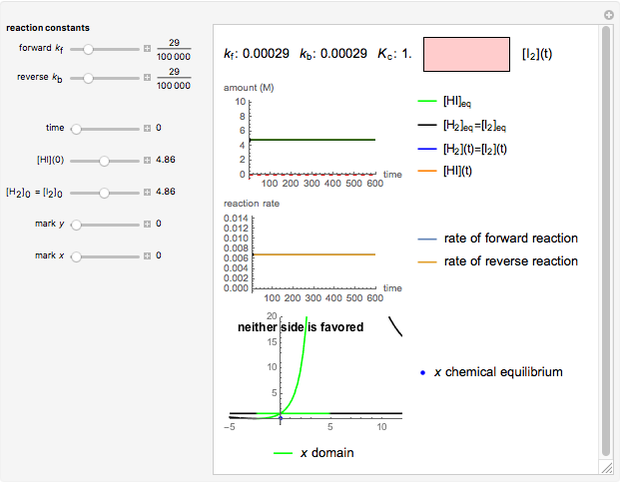 This Demonstration shows the effect of varying the rate constants and in a classic second-order chemical reaction . The concentrations at equilibrium are determined by the initial concentrations and by the equilibrium constant . The rate of approach to equilibrium depends on the forward and backward rate constants and . The initial concentrations of reactants, and are set equal. The latter can only be positive, and this leads to a system of inequations defining the validity domain of , highlighted in green. The intersection with the straight line represents the graphical solution of the equation. Whatever the grade of the equation linked to the reaction, which can be obtained by taking the maximum value between the sum of stoichiometric coefficients of reactants and that of products, there is exactly one solution, because the function in the first term of (1) is always strictly increasing . This Demonstration allows for an assessment of parameters that are usually considered separately. 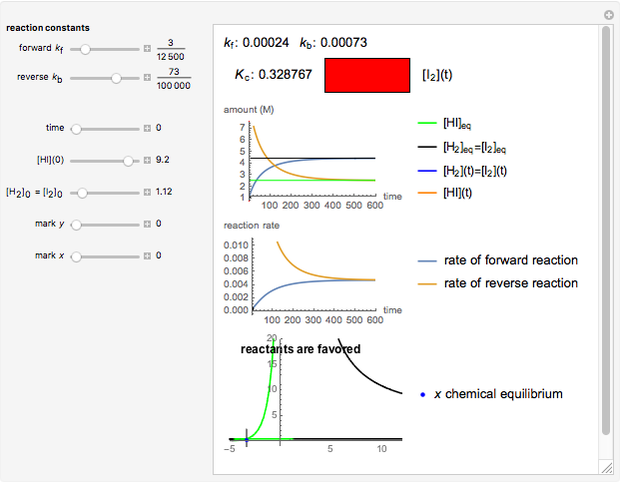 In particular, by varying the time, you can see how the reactant and product concentrations reach equilibrium when the rates of forward and backward reaction become equal. 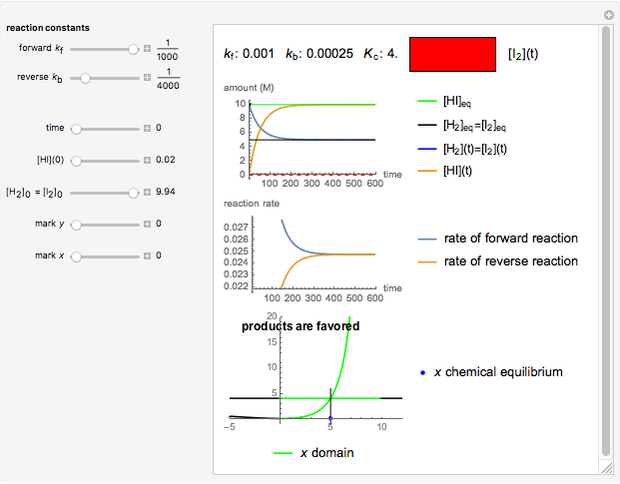 The position of the equilibrium is shifted to the right; the initial concentrations of the reactants and decrease, while the initial concentration of the product increases. The reaction has already achieved the equilibrium status; macroscopically the initial concentrations of the reactants and the initial concentration of the product do not change. The position of the equilibrium is shifted to the left; the initial concentrations of the reactants increase, while the initial concentration of the product decreases. The colored window represents the variation of during the reaction because, as and are colorless, the gaseous solution develops a reddish color depending on the concentration of , a typical color of this gas. The marks and are guidelines to help assess the changes generated by the experimental conditions. Mark moves along the time axis (as in the first two plots), while mark is connected with the concentration axis of the first plot. G. Follo, S. Z. Lavagnino, and G. Valorio, "Scuola secondaria superiore (biennio): L'applicazione di DERIVE 5 alle tematiche inerenti l'equilibrio chimico," La Chimica nella Scuola, Rome: Aracne, 2015, pp. 31–44. www.aracneeditrice.it/pdf/9788854884328.pdf. D. A. McQuarrie and J. D. Simon, Chimica Fisica: Un approccio molecolare, Bologna: Zanichelli, 2000. S. Z. Lavagnino and D. Meliga "Chemical Equilibrium and Kinetics for HI Reaction"